Ever thought about using Twitter to get some eBay business? Twitter has 500 million total users (more than 215 million active users) and serves up over 500 million tweets a day. What’s a tweet? Not just a sound effect from a parakeet anymore. Now it’s a short online comment from one Twitter user to another; tweets often flit back and forth between users who follow each other. Tweets are not only comments but also other quick notes that can be quotes, links to news stories, and the occasional self-promotion. If you like to chat, comment, and read news stories, you’ll probably like Twitter. You don’t have to be there all day, because when people “talk” to you there, you will see it in your “Notifications” column. To answer, you just click the Reply link. You’ll find that your conversations on Twitter will engage you — but only if you engage with your followers. Those who are constantly broadcasting are just trying to build follower numbers — but it’s been proven that this practice will not increase sales. Friends will find you easier. If you change businesses down the line, you won’t have to start over with a new name. On the Internet, you are the face of your business — and everything you post is archived somewhere. Your tweets on Twitter are archived in the National Archive (no joke). If it’s good enough for @MichaelDell (founder of Dell), @SteveCase (founder of AOL), @RichardBranson (founder of Virgin Group), it’s a good idea for you too. After you sign in, you need to put up a picture and fill out a short bio. The first thing you need to do is put up a picture — preferably yours. People like to see what you look like when they find you on Twitter. Do everyone a favor and describe yourself clearly, as best you can, in the allotted 160 characters. 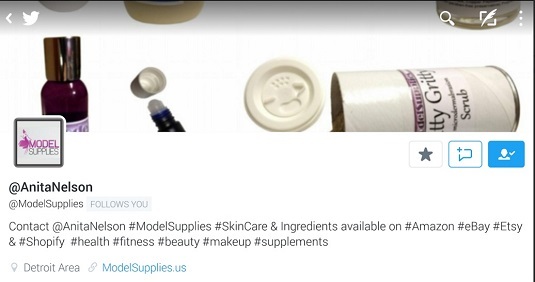 Although Anita maintains a separate Twitter account personally, the account represents her @ModelSupplies brand. eBay seller dnashopper (Anita Nelson) shows an informative bio. In the account setting page, scroll down and put a check mark in the box next to Always Use HTTPS. This will cause Twitter to use a secure connection where possible to encrypt your account information. After you fill out all the cyber-paperwork, you’ll see your very own Twitter page. It will be a very blank page. When you visit the Marsha Collier’s Twitter page, you’ll see a tab that, when clicked, reveals Lists made of people on Twitter. There is one full of eBay Social Sellers that lists eBay sellers who participate in social media and are fun to follow. Just click on the link or go to http://twitter.com/MarshaCollier/ebay-social-sellers. On the list page, just click the link and you will automatically be following everyone on the list. 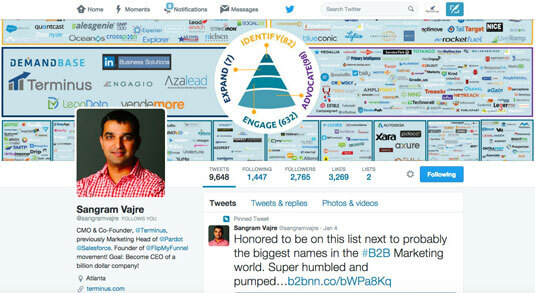 When you see their tweets in your stream, click the Reply link to say hello — or share something interesting. No doubt they will follow you back. To find other people to follow, go to the search box on Twitter. Here you can type in keywords that reflect your interests or the items you sell, and you will be presented with a list of accounts who have mentioned this word in their tweets. 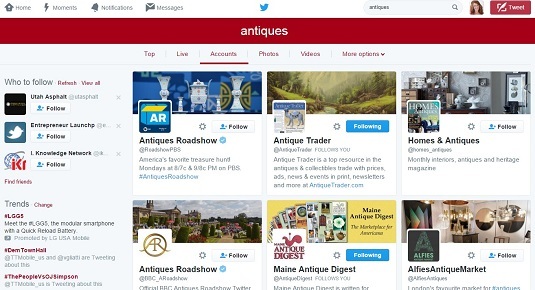 If you put in a search for antiques, click the Accounts tab in Results, you will find a long list of people with similar interests. A built-in list of people who have a passion for antiques on Twitter. Type in your hobbies and your interests. You’ll find a bunch of people to follow, and your Twitter home page will become far more interesting. You can also search to find like-minded folks on Klout. This is a website that measures social media influencers and allows searches by category. Here are the current influencers in the topic of jewelry-making. 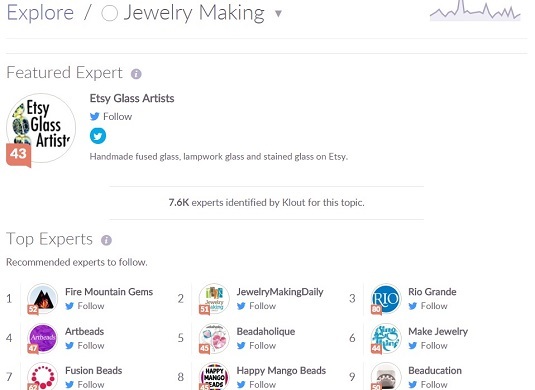 Klout measures social media influencers across the major platforms. Search Klout with keywords, and you can find (by clicking All) folks who tweet about topics that interest you.